Father to Father, Inc. will hold an open house Thursday Aug. 23 at 5 p.m. at its new program office serving fathers and families in Colleton County. The office is located at 209 E. Washington St.
S.C. Sen. Margie Bright Matthews (D, Colleton District 45) will provide opening remarks at a ribbon-cutting ceremony at the waterfall at War Memorial Plaza on E. Washington Street with light refreshments and tours of the new office to follow. The mission of Father to Father is to provide support in personal development, parenting, health and wellness, job readiness training and other resources to help men become responsible fathers for their children and families. 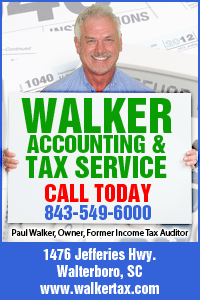 The Walterboro opening adds a new location to existing offices in North Charleston and Moncks Corner. Father to Father serves Allendale, Beaufort, Berkeley, Charleston, Colleton, Dorchester, Hampton and Jasper counties. Father to Father is part of the South Carolina Center for Fathers and Families. The center is the hub organization for a network of 18 fatherhood programs providing access to father-focused services in every county of the state. The new program office serving Colleton County continues the statewide expansion of fatherhood programs made possible through a partnership with the Department of Social Services. In 2017, the affiliated programs served more than 3,200 program participants and positively impacted the lives of more than 7,500 children in South Carolina. Best wishes for successful and WELL ATTENDED program!